There’s no better way to show your loved ones and friends that you care than by giving them the gift of Nature’s Script this holiday season. 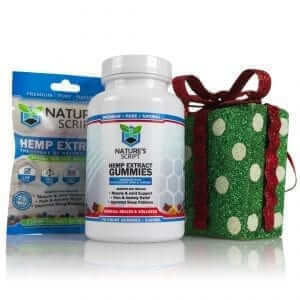 With Nature’s Script premium Hemp products, we guarantee that your gift won’t go unused or regifted on another occasion. 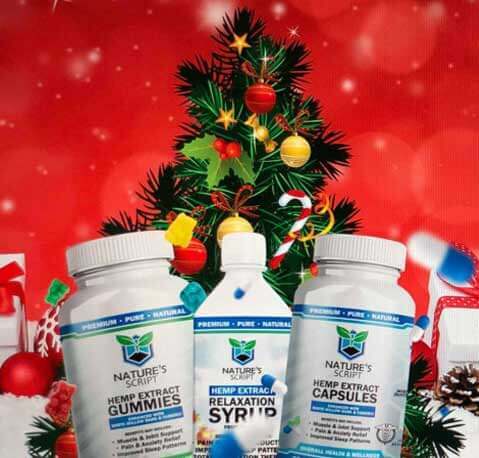 Spread holiday cheer by introducing those you hold dear to a world of health and wellness benefits. Follow Nature’s Script gift guide to find the perfect stocking stuffer for all the special people that you have in your life. CBD, or Hemp Extract, is one of the most buzz-worthy health and wellness products this year, and rightfully so. CBD is an all-natural cannabinoid with medicinal benefits that can relieve anxiety, stress, pain, inflammation, insomnia and so much more. Hemp Extract has the potential to provide therapeutic assistance, and Nature's Script products are THC-free without any psychoactive effects. Our certified pure CBD is sure to be the reason you jingle bell rock this season. If you have a friend or a family member who works tirelessly decorating and preparing for the holidays, we have just the product for them. Show appreciation for those who work the hardest in your life by giving them the gift of mental clarity and pristine focus. 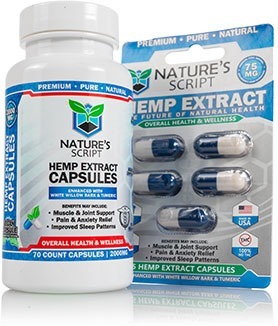 Nature’s Script Hemp Oil is our purest Hemp Extract product, delivering medicinal benefits such as anxiety relief, stress relief, pain relief and much more. The Hemp Extract used in our premium Hemp Oil is sourced from American farms that only use sustainable and eco-friendly cultivation methods. We guarantee you a certified pure CBD product that contains no traces of THC. A few drops of Nature’s Script Hemp Oil will help the workaholic in your life attain a sense of calm and relaxation this holiday season. 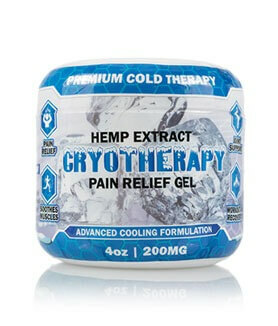 The athlete in your life is going to love our Hemp Extract Pain Gel. 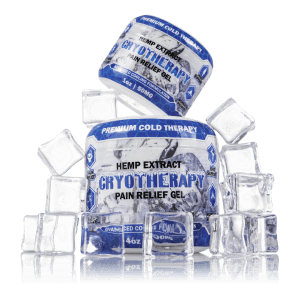 Whether they play a sport or participate in reindeer games, Nature’s Script Pain Freeze will help recover and revitalize areas of muscle pain. Comprised of Camphor Oil, Aloe Vera, and pure Hemp Extract, our topical Pain Gel provides a soothing and cooling sensation for aches, cramps, strains and spasms. Nature’s Script Pain Relief Gel can be applied before or after physical activity to help encourage joint and muscle mobility. Our CBD Pain Gel can be applied up to four times a day to deliver long-lasting relief for stubborn pains. Even Frosty the Snowman will want to get his hands on this product! Even if you don’t partake in vaping, you may have a friend or family member who does vape. 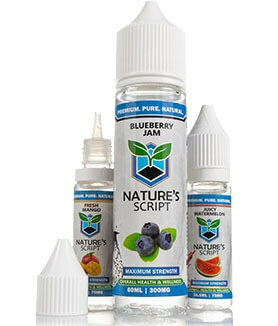 Nature’s Script offers some of the most refreshing and best tasting vape flavors including Blueberry Jam, Fresh Mango, and Juicy Watermelon. Our Hemp Extract E-Liquids make such a great gift because of the potential health benefits they provide. Deck the halls with clouds of smoke with our 70/30 VG/PG split Hemp Extract E-Liquid. Our Vape Juice contains no traces of nicotine or THC. Vaping Nature’s Script E-Liquid promotes a calming and relaxed state of mind and can help treat anxiety, stress, pain, and more. If you are a pet owner, you know that one of the greatest joys of the holidays is seeing your furry friend opening a present that us just for them. 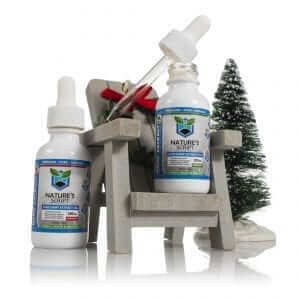 Crafted with your pet’s health in mind, Nature’s Script premium Hemp Pet Oil is an all-natural, human grade Hemp Extract product that can help treat an array of conditions. Your pet may find relief from separation anxiety, chronic pain, arthritis, skin irritations, and much more. 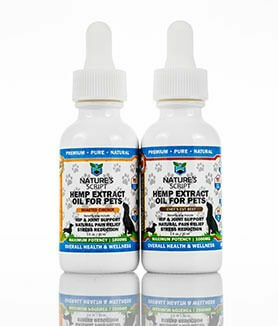 Served in both beef and chicken flavors, your pet will love the taste of our Hemp Oil and how it makes them feel. 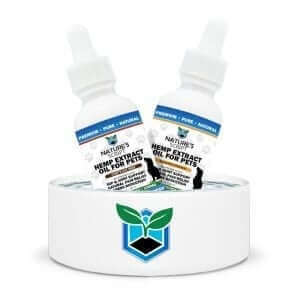 At Nature’s Script, we ensure that your pet won’t experience any harmful side effects and verify the safety of our Hemp Pet Oil through third-party lab tests. Our premium Pet Oil has the potential to promote your pet’s joint mobility and overall wellness. We all know someone who stays up all night watching TV or waiting for Santa to show up and then wakes up tired in the morning. With Nature’s Script Hemp Gummies, your sleep deprived loved one can say goodbye to their restless nights. Our delicious and chewy Gummy Bears come packed with a potent dose of Hemp Extract that can provide even the worst sleepers a healthy night’s rest. Our Hemp Gummies encourage a calming and relaxing state of mind that ease you into a peaceful slumber. 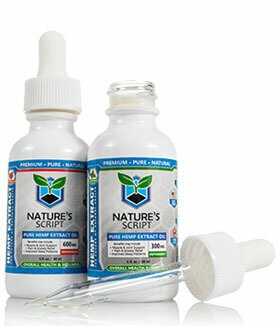 Nature’s Script Gummies are designed to help combat insomnia and anxiety related to poor sleep at night. 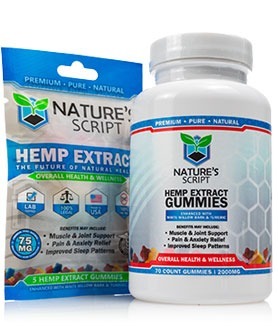 Additional benefits of Nature’s Script Hemp Extract Gummies may include pain and inflammation relief. Give the gift better rest and health this holiday season!